Vitamins A, C and E provide antioxidant protection. Shake well. Sparingly apply a thin (masque-like) layer onto freshly cleansed, dry skin. Remain expressionless. Product will dry within 3-7 minutes. When face feels pulled and tight, look in the mirror. At this moment, you’ll look years younger. Enjoy! Splash skin with water until product is no longer visible. If any residue remains, use wet fingertips to gently remove. Using a towel, gently pat skin dry but do not rub. As skin dries, you will feel a subtle firming that will last all day. Continue with your usual skin care routine. 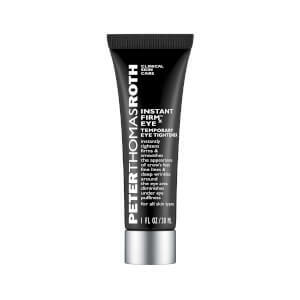 Instant FIRM can be used before treatments, moisturizers and makeup, or alone. This product is great when you need a quick lift. Leaves no residue if you do not use too much, It lasts longer that way too. I have been using the FirmX under eye tightened and I liked it a lot so ordered this product. I used it under my eyes and around the mouth and forehead. It makes a difference and does what I am looking for. It's not a miracle gel but it reduces the appearance of puffy eyes and fine lines. I like this better than the under eye FirmX because it's a clear gel vs. white gel that leaves a residue if you don't mix it with a moisturizer. It's important to experiment with how much to apply and moisturize your face thoroughly beforehand. Less is definitely more. This stuff is amazing. It really tightens my skin and smooths out my wrinkles. I couldn't believe my eyes, it makes me look years younger! Some people say they have a problem with white residue but I don't have that problem at all, maybe because I allow a long time for it to dry, at least 20 minutes. My mother also wanted to try it after she saw my results so I bought her a tube too. She looks years younger and she loves this product! It works on your body too! It tightens some flabby spots and smooths out my stretch marks! 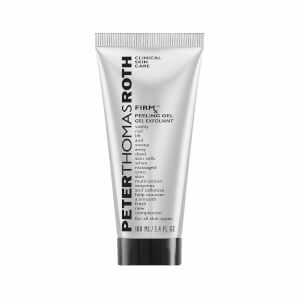 Thank you Peter Thomas Roth for such a great product! This is the strangest product ( in a very , very good way) - you put it on and then you do not move your facial muscles. Wella ! I looked 20 years younger or more. Your face is really tight and it was tough to speak, but I went to an outdoor party and applied tinted sunscreen over this and did not look like my mother wearing my clothes. Immediately purchased the one for the eyes. Love, love,love this!!! I received a sample of the product with another purchase. Typically I do not use products that have not been recommended by my dermatologist, but this one made me curious. On a lark I tried it and within 5 minutes the laugh lines had all but vanished and the fine lines around my eyes were gone. I have since purchase the full size, the FIrmX eye and the Unwrinkle Lip. I only wish I had found these before spending $4,000 to have my face lasered three years ago! My sister and girlfriends are getting this for Christmas! I received a sample of this and was amazed when I tried it. Had a little problem with the flaking but I think because I used the sample several times and it was drying out. I immediately ran out and bought the full size. I put it on and walked out of the room and my husband said "Wow - you look so young" (I kid you not - he said this). I now have to try the rest of his products. ps My skin is a mess with scars - this product smooths everything out! I just used a sample that I received with another product. THIS is the BOMB!! I can't believe how well it works! Will definitely buy the product, and can't thank you enough for the sample! I would not, however, recommend it for around the eye...it is that powerful and will draw the skin around the eye down. I have found it to be the new fountain of youth-it tightens the skin-but you must be careful not to put too much because it will flake when you put your make up on-so what I have been doing is mixing it with a cream that I put on and it works better that way for me anyway. Bottom line-it works and I won't be without it-it's a face lift in a tube. Directions have been changed for the BETTER! Reading over the reviews, I see that the application for this product has changed. I used sample packets before purchasing the tube and would NOT have bought it had I gone by the reviews. I apply on a clean, dry face; wait 3-5 minutes and then, using my little finger, smooth off any residue (there rarely is any). Apply moisturizer, SPF, makeup, etc. NO ISSUES. Face stays tight/lines fill in until I wash my face that night. I wonder if he's adjusted the ingredients or tested out application techniques based on customer feedback? In any event, the new directions are completely different than those listed here and the product is simply AMAZING!! !